The familiar and often overused phrase has made its way into our culture as a joke. We use it when you get the wrong order at Starbuck’s, when Instagram won’t load, or when your phone is going to die. We tell the world on Twitter, slap a hashtag on it – #FirstWorldProblems – and it’s like you’re absolved of making such a careless complaint. You’ve acknowledged your ignorance and all is forgiven. Right? Well, unfortunately, this phrase has become entirely too common in my house. It started out where one of our friends continued to notice and call out the complaints of almost everyone we hung out with. Eventually, we decided that some consequences were in order for the offending party. We started a first world problems jar that we decided would collect $1 for every unnecessary complaint. Oh, the Internet connection that allows you access to pretty much any information in world at the palm of your hand? Dollar. What about the dozens of freshly washed clothes that you have hanging color-coded in your closet? Dollar. The dishes that you eat delicious, home cooked meals off of multiple times a day? Dollar. 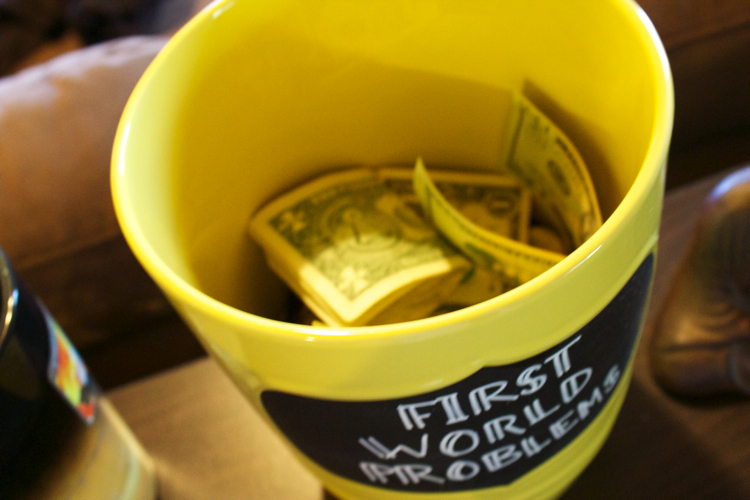 Within the first week of using our first world problems jar, we had already accumulated over $10 between the two of us. Then, as people would come over to hang out, the jar became a conversation piece, and we would get a good laugh about who had to put a dollar in at the dinner table. It became kind of like a game. Sure, it was all in good fun, but you don’t realize how many things you say that sound so unbelievably spoiled and unappreciative of all the wonderful things you have, that so many others don’t. What started out as a joke, quickly turned into self-awareness and reflection. It felt good to be held accountable for the things that were coming out of our mouths – things we hadn’t even noticed we were saying just a few weeks prior. It felt like an act of self-improvement. But eventually, we were faced with the ultimate first world problem: there got to be so much extra cash in the jar, that people began asking us what we were going to do with it. A couple’s massage? A nice dinner out? Or maybe if we let it add up enough, a trip somewhere! Yes, there was that much in there. What we were doing and why we were doing it in the first place was quickly overshadowed by money. Just like that, our first world problems jar became an act of greed, and we didn’t even notice the irony as we thought of the possibilities for our extra savings. That was until B and I had a movie night. We watched Living On One Dollar, a documentary about a group of students who spend two months in Guatemala with just $1 a day to live. We sat there watching these smart, educated kids – not unlike ourselves – battle hunger, thirst, illness and other problems that are every day struggles for so many. They got to know real people living in this community and understand that the problems that they face are much more pressing than anything they’ve ever experienced in their own lives. But while these kids were getting an invaluable experience, they also took comfort in the fact that they would be going home to their first world lives after 56 days – not everyone gets that same luxury. Without knowing, our first world problems jar quickly turned from a silly conversation piece over cocktails, to something much bigger. We sat in silence after the documentary ended. I had tears in my eyes, and neither of us said a word. But we didn’t need to. For that moment, we both felt enlightened, yet ashamed at the same time. We sat there drinking wine, watching a movie on one of our two TVs in our 1100 square-foot apartment in Hawaii. We had been so high and mighty about our little first world problems jar, like we were doing something so charitable and worldly by calling each other out. Certainly, it was a step in the right direction, which led us to where we are now. But after truly thinking about the bigger picture, simply acknowledging our narrow-minded and self-indulgent ways wasn’t nearly enough. At least not for us. Suddenly, our problems and desires felt so insignificant. We had so much more than we could ever need, and we knew exactly what we were going to do with the money that had stem from our own selfish, spoiled, first world issues. B and I decided to donate the money from our jar. We haven’t decided yet where we’ll donate it, but chances are we’ll donate it to http://livingonone.org/, the organization behind the film that inspired us. While we are both by no means wealthy, and we are both working very hard to pay off our own debts and get to where we want to be financially, we are also much better off than so many. If we all did a little, a little can go a long way. If you haven’t watched this documentary, I strongly encourage you to. It’s on Netflix, and can really transform the way you see things. We can all use a little eye opener like this once in a while. I’m not claiming to be perfect, or to be making some sacrifice that is going to change the world. Honestly, I still say things that cause me to put $1 in the jar – I’m human. One of the biggest parts of this adventure I’m on is to learn about myself and the world along the way. And I’d rather take baby steps in the right direction, than none at all. 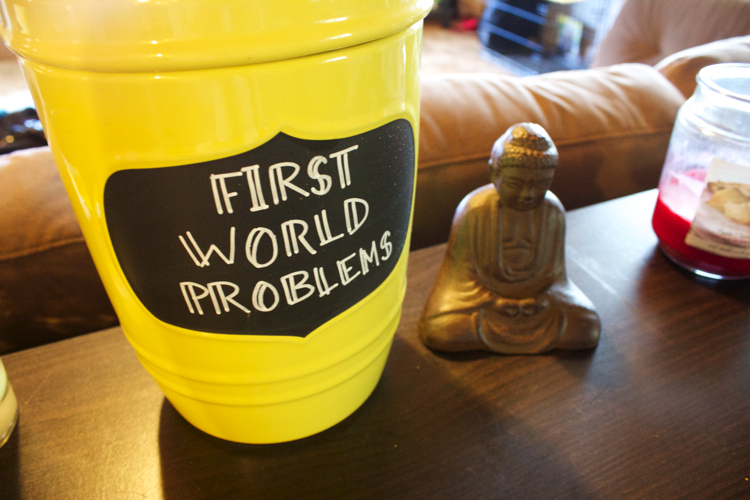 Do you have a first world problems jar? Or do you have a suggestion about where we should donate our funds? Comment below!